Student loan repayment is something that many people have to deal with at one point or another. With the high cost of a college education, it is not uncommon for people to accumulate student loan balances while in school. If you have student loans, here are some of the repayment plans that you may be able to choose from. The first option that you will have is standard repayment. This is the most simple and basic of the repayment methods available. With this option, the lender will simply take the amount that you owe, add interest and then amortize it over the life of the loan. They will then divide this by the number of monthly payments that you will have to pay. The number from this calculation will represent your monthly student loan payment. Another option that you might want to consider is the biweekly repayment plan. With this option, you will make half of your monthly payment every two weeks. This option is preferred by many because it allows them to make smaller regular payments instead of one large payment every month. With this option, you are actually going to end up making one more full payment per year. This has the ability to reduce the amount of time that it takes to pay off your loan and save you some money on interest. 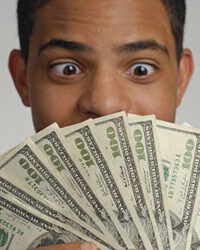 Another option to consider is income-based repayment. With this option, your payment is going to be based on how much money you make. The lender will calculate how much discretionary income you have, and your payment will be a certain percentage of this number. Extended repayment is another option for you to look at. This method will allow you to extend a loan to as long as 30 years. This provides you with a much smaller monthly payment, but it ends up costing you a lot more in interest over the years. It will also significantly add to the amount of time that it takes to pay off the loan. The graduated repayment plan is another option that could potentially help you pay off your student loans. With this plan, your monthly payments will start out small and then work their way up over the years. Your payment is going to increase every two years with this method. This method is very similar to the income-based repayment plan. To determine your monthly payment with this method, the lender is going to look at your income, your family size and how much money you borrowed. They will reevaluate your payment every year and adjust it accordingly. This is another variation on the income-based repayment plans. This method will require you to pay a certain percentage of your gross monthly income every month. You may be required to pay as little as 4 percent or as much as 25 percent. Private lenders will have their own programs when it comes to repaying student loans. Most of the time, they will give you the standard repayment term, but they also might offer graduated, extended or income-based repayment plans. How to Choose a Private Student Loan Repayment PlanDevelop a Strategy for Student Loan RepaymentOverview of Student Loan Repayment ProgramsWhat is the Nursing Education Loan Repayment Program?